Skoda has provided its strongest hint yet that it will add a third SUV to its range, with the unveiling of the Vision X concept at the Geneva Motor Show 2018. 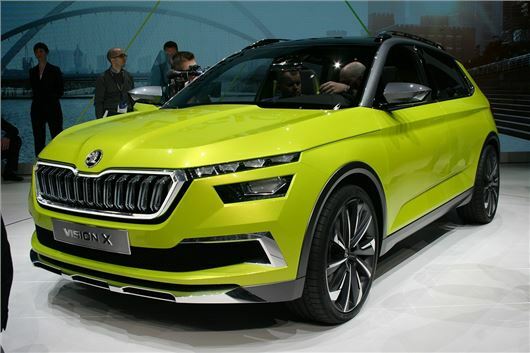 Similar in size to the SEAT Arona and Volkswagen T-Roc, the Skoda Vision X concept promises ultra low running costs and emissions due to its unusual hybrid system that uses compressed natural gas, a petrol-powered engine and an electric motor. The hybrid system produces 130PS, with the compressed natural gas driving the front axle while the rear is powered by the electric motor - the latter being activated occasionally to generate additional power when pulling away or to improve traction on slippery surfaces and off-road. The hybrid system is supported by a second electric motor, which gets its energy from a 48-volt lithium-ion battery that automatically recovers energy from vehicle braking and coasting. Skoda claims that the battery is sufficient enough to power the car for up to 1.2 miles on electric charge alone. As well as providing zero emissions for urban driving, the rear-wheel drive can transfers 1000Nm of torque onto the road thanks to a petrol reserve tank. Skoda claims that the Vision X has an outright range of 403 miles, although it isn’t clear how the gas tanks – situated under the rear seats and rear axle – are refilled. The exterior styling echoes that of the larger Kodiaq SUV, with a large grille that's flanked by slim LED daytime running lights. The headlights also used LEDs and feature a lead crystal design. Inside, the Vision X has space for four adults and offers 380 litres of bootspace. Other concept features include a keyless entry system that can offer the car for rental when it is not needed or allow permitted drivers to use the vehicle. For example, ensure that children are picked up from nursery if their parent or guardian cannot make it on time. The car also gets a special anchoring system for two electric skateboards and carries two helmets and a camera drone, which the skateboarder can use to record a video of their speedy ride - always handy for the school run. Or maybe not.